This story was first published in French in 1941 and returns to the theme of an exotic adventure. Tintin sets off for North Africa. He thwarts a scheme thought-up by a gang of criminals who have hidden opium in tins of crab-meat. Thanks to this adventure, Tintin meets Haddock who will become his side-kick in the future. While chasing after the strange tins of crab-meat, Tintin meets his side-kick of the future: Captain Haddock. Haddock is not at his best, to say the least. He is both Allan's prisoner and totally alcoholic. Before being cured, we shall have the pleasure of hearing the famous insults: pockmark, gibbering ghost, freshwater swabs and many more, blistering barnacles! The story that you are about to read, or re-read, starts with a scene similar to that of a silent movie. Snowy is scolded by his master for having explored a dustbin. A few moments later, Tintin does the same. Snowy returns the compliment! Good for you, Snowy! Take a look ! it's the work of a professional. The similarity between the two cargoes is incredible. For Hergé, it is essential to have the right documentation to create each vignette in a large format. The scenery has to be exact but remaining in the Tintin style; "each detail has its importance while at the same time being integrated into the final drawing of the vignette" (Numa Sadoul, Tintin and I, Ed Casterman,p.64). For more information consult the dossier "tooot": Ports and docks. The Captain, who first appears in The Crab with the Golden Claws, finds himself in tatters: "a slave to his addiction!" (Numa Sadoul, Tintin and I, Ed Casterman, p.156). He finally bursts into tears whilst thinking of his mother ! This total lack of control does not often happen in the Tintin adventures. As we do not meet "mama", we can only imagine what she has been through. With a son like the Captain, she must have suffered. I am dying. After the plane crash, Tintin and Haddock cross the desert in search of water. Due to exhaustion and alcohol, Haddock starts to hallucinate. Fortunately, Snowy is there to protect Tintin. Overcome by thirst, heat and exhaustion, Tintin and Haddock collapse in the middle of the desert. 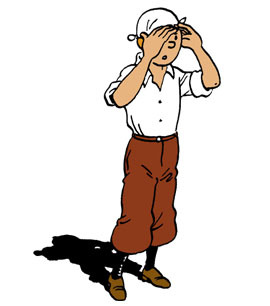 Tintin has a nightmare which is provoked by his fear of being mistaken once again for a bottle of champagne. It takes 3 vignettes by Hergé to arrive at a terrifying ending. Terrified when being shouted at insultingly by the Captain Haddock, the Arabs cease to fire and run away from his nasty fit. Hergé was quite happy about this drawing: "in a single frame, a series of movements, broken up and distributed among several characters. I read all ‘TinTin’ cartoon books in Thai version when I was child. Now, I am reading ‘TinTin’ in English version. I love it. Excellent, always loved the full page artwork in this book. my first book. I read at 1964, The seven cristal balls and after that day I wish to read all the tintin's book. But in Brazil at that time was'nt easy to access. Sometimes i found out 1 book at bookstore, or searching german magazines, like der spiegel which published some cartoons about Tintim.Ans I had a friend from Lisboon, which send me some editions from weekly tintin. I've learned about some new things in Tintim e was extremely useful during my life. Last Year I went to genebra e nyon just to see where Tintin and the captain make a pursuit to Caculus, Ans I stay veru happy wheNext month I'll go to Belgium. As always. Tintin is the best. And I love the drawings in this one particularly. I wish they would speed up their releases of the titles. Considering that all these were translated in English a long time ago I cant understand why they are re translating them and releasing them. I have the book, and the movie. This is good show.